Sweet Corn Chat is one of the easiest snacks to make. I would call it a recipe for those who have just started to cook. It’s easy! You can bookmark this recipe for the time when the guests pay you a visit at home. A healthy snack for munching while chatting with your guests at home. 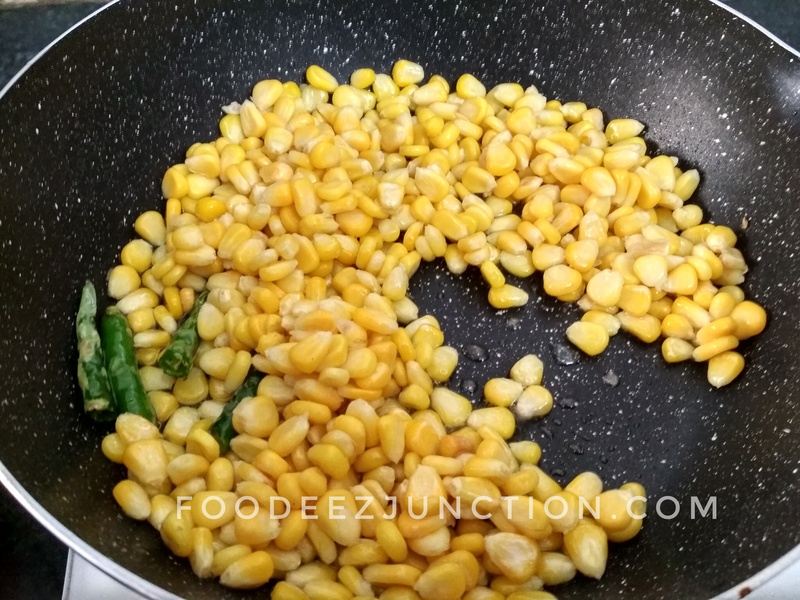 All you need to make this quick snack – sweet corn pellets and a few spices from your kitchen rack. Heat olive oil in frying pan, add green chillies. Fry for a minute. Add sweet corn pellets. Mix well. Now add all the ingredients mentioned above. Fry for seven to 10 minutes. Stir in between. Garnish with coriander leaves (optional). Serve the Sweet Corn Chat hot. Take a frying pan, out it on low flame. Add olive oil and heat. Now add the green chillies and fry them. Once they are fried, add sweet corn pellets in the pan. Mix. Let them coat well with oil. Add rest of the ingredients and mix. Adjust the taste of the salt accordingly. Turn heat to medium flame and keep stirring in between. Fry for 7-10 minutes while adjusting the flame. If you want you can garnish with freshly-chopped coriander leaves. I like this sweet corn chat without any garnish. You can use red Chilli flakes instead of green chillies.